For the ancient Egyptians water was linked to life. Every Egyptian creation text begins with the same basic belief. Before the beginning of things, there was a primeval abyss of water: everywhere, endless and without boundaries or directions. This abyss was unlike a sea, for there was neither up nor down – only an endless, deep, dark, infinite abyss. Egyptians called this watery chaos Nun. So, it isn’t surprising, that it was by the banks of the Nile that one of the oldest civilizations in the world began. The River Nile is the longest river in the world, stretching north for about 6,670 km from the heart of Africa to the Mediterranean. 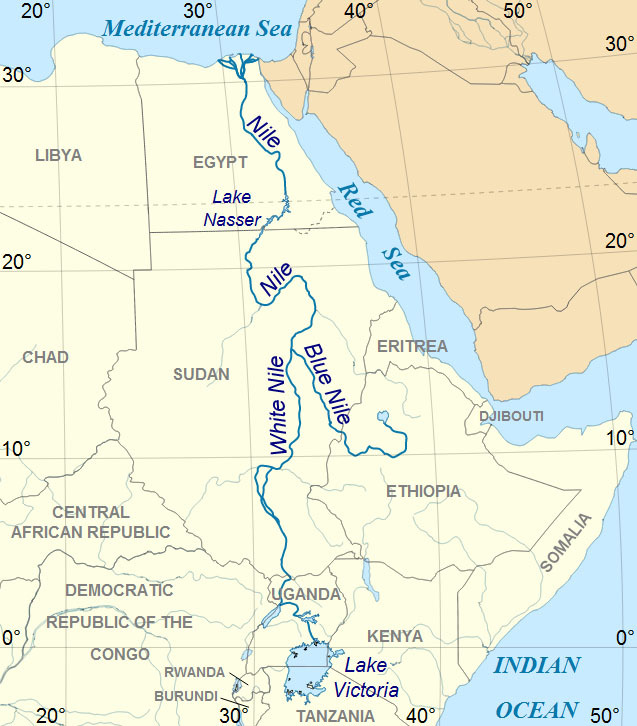 The Nile is formed from two main tributaries: the Blue Nile and the White Nile. The two rivers converge at Khartoum in Sudan and then go on a long journey northwards towards the sea. The Blue Nile is the shorter tributary, but it contributes the majority of the water. Its source is in the highlands of Ethiopia. The White Nile is the longer branch. The source of this river is the true beginning of the Nile. Although Lake Victoria is still often considered to be the source, the Nile can actually be traced back further, to the headwaters of the longest river flowing into the lake. It turns out that this is the Kagera River and its remotest source was traced to the hills of Burundi. In the ancient Egyptian language the Nile was called ‘Iteru’, which simply means ‘river’. From the earliest times, the waters of the Nile, swollen by monsoon rains in Ethiopia, overflowed the banks of the Nile. This happened every year between June and September of the modern calendar, creating a fertile green valley across the desert. The ancient Egyptians called this season ‘akhet’, which means inundation. When the flood went down it left thick rich mud, which was excellent soil to plant seeds in. So, most Egyptians lived near the Nile as it provided water, food, transportation and excellent soil for growing food. Sailing the Nile means experience Egypt by water. It is an original and peaceful option to navigate on the river Nile. Discover the most singular places of the landscape. Visit impressive temples and excavations. Celebrate that special anniversary. Have the most romantic holiday. Go fishing with friends. Observe the bird life. Learn more about the stars. All these activities are suitable for an unforgettable Nile Experience. There are three different types of boats to choose from for sailing the Nile: a Dahabiya, a Sandal or a Felucca. We can arrange all three of these possibilities for you. Which one you prefer will depend both on your budget and on whether you want a more luxurious or adventurous way to sail the Nile. A River Nile Experience however is achievable for everyone. We hope you take advantage of one of these wonderful opportunities to sail down the Nile. Time to leave you cares behind. Step on board, sit back, relax and daydream about days gone by in ancient Egypt. Look by Tour Options and Custom-made Tours for the possibilities.